We are really lucky that our kitchen has been the drop off point for friends and neighbours excess fruit and vegetables this year. We’ve been busily turning cucumbers into chutneys, red onions into relishes, quinces into jams and green beans into piccalilli. But our favourite solution for dealing with a glut of veggies has been to make quick and easy pickles. We love the Turkish pickles that we spotted this year while on holiday in Bodrum. They usually include whole hot chillis, random chunks and slices of turnips, cabbage, cauliflower, onions, garlic and carrots all thrown into massive jars topped up with vinegar. They are only left for a few days to pickle so they add a crunchy bite to kebab wraps and balik ekmek (fish sarnies). With these pickles in mind, we decided to make our own version of red cabbage and beetroot pickles. 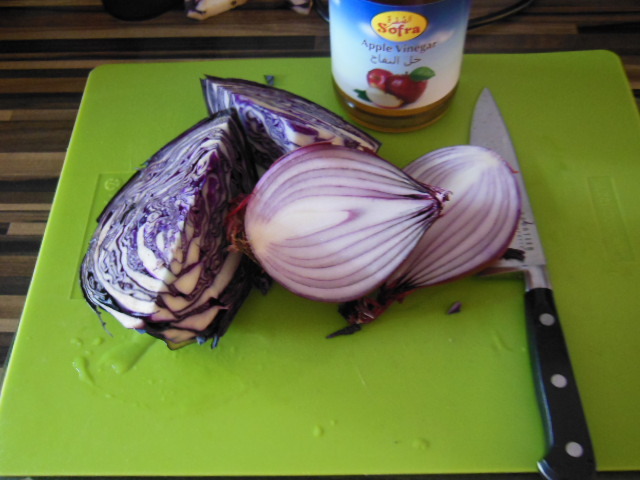 Finely slice a small red cabbage and one red onion. 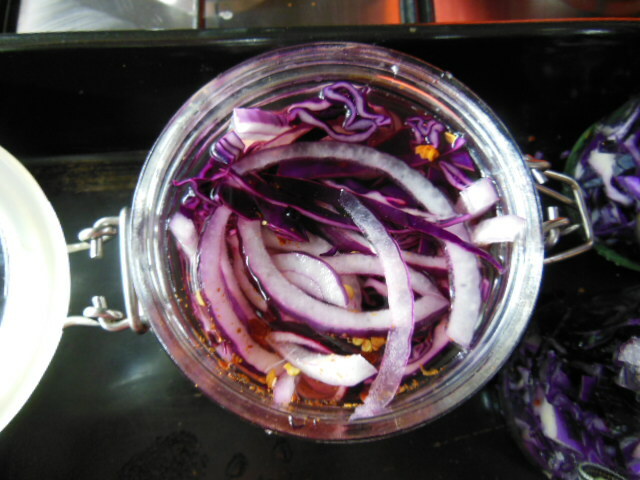 Mix the cabbage and onion slices and pack into sterilised jars. Add 1 teaspoon of salt and 1 teaspoon of sugar to each jar. You could add a bay leaf or dried chilli at this stage. Top up the jar with red or white wine vinegar or grape vinegar. We used apple vinegar which is available from Turkish supermarkets or Mahgreb on Hoe Street, Walthamstow. Seal the jars and leave for about 1-2 weeks before eating. The pickles will keep for a couple of months and should be stored in a cool, dark place, then in the fridge after opening. We made jars of beetroot pickles following the same recipe, replacing the red cabbage and red onion with shredded golden, red and candy-striped beetroot. 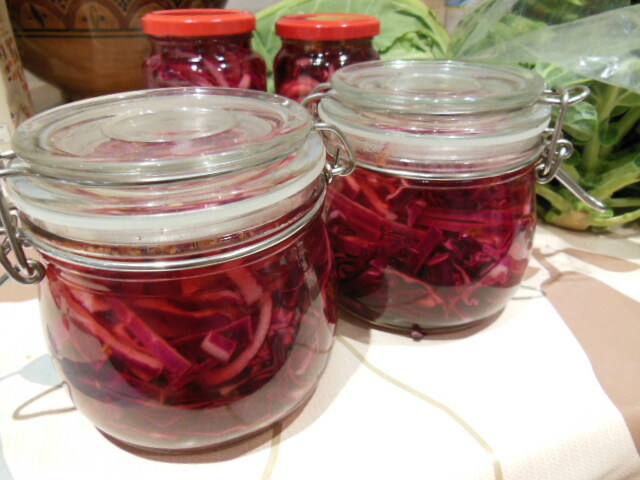 This entry was posted in Recipes and tagged Beetroot, mahgreb, Pickles, Red cabbage, Red onion, simple, turkish, Vinegar, Walthamstow. Bookmark the permalink. 1 Response to Simple pickles!